A film by Emma Christopher, Ph.D. In Central Cuba, proud members of the Ganga-Longoba, a small Afro-Cuban ethnic group, have kept their unique heritage alive. 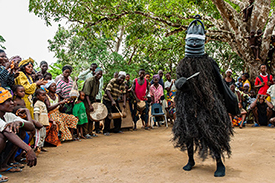 Incredibly, through decades of brutal enslavement, independence wars, and then the denying of all religions after the revolution, they have retained a collection of distinct songs and dances that one of their ancestors brought from Africa as a slave. Each December 17th they still perform them at the San Lazaro ceremony. After a chance discovery while working in West Africa, director Emma Christopher spent two years showing a film of the Ganga-Longoba songs and dances to several thousand people across Sierra Leone. Eventually, in an isolated village with no road access, one man looked at another in joy and wonder as he watched a recording of the Ganga-Longoba songs and said, "THEY ARE WE!" Then the villagers joined in with others of the Ganga-Longoba songs, still recognizing them clearly despite all the years of separation. Returning to Cuba, Emma showed her findings to the Ganga-Longoba. "We are not so alone anymore", said one of their number, woodcarver and artist Alfredo Duquesne. Later he would say that knowing where he came from "is divine." In early 2013, after the law changed allowing them to freely leave Cuba, a trip was at last made to visit Sierra Leone. It turned into a remarkable celebration, a rare recognition of the tenacity and resolve of one young girl who once made the awful journey from Africa to Cuba, but never let her memories of home die. THEY ARE WE tells the story of the Ganga-Longoba and of the village their ancestor called home. African Diaspora International Film Festival 2014, Washington D.C.